I met Nemo the other day. Well, actually it was his cousin. Instead of a cute bright orange and white striped Clownfish, this little guy was a vibrant yellow and turquoise with dark stripes. It swam right up to my snorkel mask, in my mind to say, “Hi!” Really, what it was probably thinking was “bug off,” given that it was a Sergeant Major Fish and highly protective of its territory. I was living the good life on a Planet Dolphin catamaran sailing and snorkeling tour off of Quepos and Manuel Antonio, on Costa Rica’s Central Pacific Coast. What better way to enjoy the tropics than lazing about a luxurious huge catamaran, being served unending frosty tropical juice drinks by gracious and friendly staff, and cruising leisurely down the coast looking for wildlife and gorgeous scenery. The afternoon sun soared overhead, but under expansive shade cover, the light sea breezes were delightfully cooling. The sea glittered with a zillion sunbeams. Manuel Antonio’s magnificent steep coastline poured green vegetation down to the jade-green sea, punctuated by million-dollar resorts and vacation homes peeking out exotically here and there. Sergeant Major Fish notwithstanding (and they really are entertaining little fish), snorkeling in the Manuel Antonio Marine Preserve just off Biesanz Bay is lovely. Warm water, clear visibility and multitudes of vivid tropical fish make for a fun experience. Planet Dolphin handily provides all the gear – masks and snorkel, swim fins, lifejackets. If you want to ramp it up a notch, a near-vertical water slide aptly named “Tsunami” will rocket you off the boat’s stern. Or you can try a more than 10-foot plunge from the top deck into the water. After our brief snorkel and swim, we cruised offshore in search of dolphins and other marine life. Planet Dolphin’s captain and crew were adept at finding a huge school of hundreds of Pacific Spotted Dolphins in a feeding frenzy amid flocks of diving pelicans, Magnificent Frigates, and other sea birds. Then it was time to visit a few sea bird rookeries and tiny volcanic rock islands before anchoring in a calm cove for gourmet sunset-view dining. Planet Dolphin crew served up a delicious meal of fresh barbecued fish brochettes, pasta salad and fresh tropical fruit. Calm descended over the 80 or so passengers while reggae music softly played in the background and the sun’s fiery ball melted toward the horizon. We savored another picture-perfect Manuel Antonio sunset before motoring 5 minutes back to the Quepos Pez Vela Marina dock. Planet Dolphin provides two tours daily – in the morning at 9:00 am and in the afternoon at 2:00 pm – departing from the Pez Vela Marina in Quepos. Both last approximately 3.5 hours and include snorkeling, unlimited drinks and a meal. You can sail aboard the large70-foot, 110-passenger Tom Cat II catamaran; the roomy 60-foot, 45-passenger Tom Cat I; or the 37-foot Spanish Dancer sport catamaran, which is usually reserved for small groups and private tours. Valle Dorado Tours is proud to offer the Planet Dolphin catamaran trip as one of their featured one-day tours in the Manuel Antonio / Central Pacific Coast area. 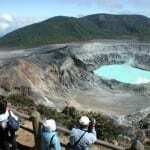 Contact Valle Dorado Tours to experience the top one-day tours and custom tour packages in Costa Rica. More than 20 years of local experience in the Costa Rica travel business, and personal inspections by their professional team of all tours, hotels, destinations, transportation, etc., ensures that . 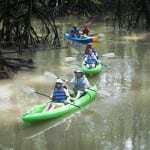 Explore their extensive menu of one-day tours, destination tour packages, thematic tour packages, and custom tour packages all over Costa Rica. Their expert travel staff can help you arrange your Costa Rica vacation from start to finish.